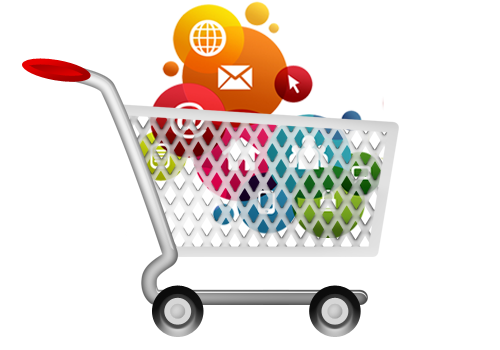 We specialize in high conversion eCommerce website design and development. Software alone doesn’t make a successful eCommerce business! Let us guide you on the path to a successful, high converting, engaging, eCommerce storefront. Are you thinking about selling products, downloads, or services online? Most people are very familiar with buying over the Internet. If your business is thinking about an eCommerce storefront, we can help explain the many different options and what is involved with each solution. Whether you are a B2C or B2B business – or combination of both, we can take you step-by-step through the process of choosing an ideal solution according to your business plan, back office shipping and/or accounting integration needs within your budget expectations. Whether you’re looking for a major website redesign, specific design work, or help driving additional traffic to your store, a professional eCommerce consultant can help make your online business more successful. There are many, many choices when selecting an eCommerce solution. We invite you to visit the web sites of a few most popular eCommerce software solutions, compare features and pricing, and contact us for assistance in selecting the right eCommerce platform for your business. WooCommerce transforms WordPress into an online shop with product management, stock control, integrated shopping cart and checkout, coupons and much, much more. And like WordPress, WooCommerce is free to use. WooCommerce is easy to use and low-cost to set-up and maintain. Customization work and additional plugins and development can extend your online store to suit requirements. Built using WordPress best practices both on the front and the back end, resulting in an efficient, robust and intuitive eCommerce storefront. With your dashboard, keep a birds-eye view of incoming sales and reviews, stock levels and general store performance and statistics all from the WordPress dashboard or go to the reports section to view stats in more detail. Checkout our WooCommerce Plus WordPress eCommerce Package and start selling online. As a hosted software-as-a-service (SaaS) platform, Shopify is one of the simplest and most used subscription-based platforms that allow point-and-click setup of an online store. Shopify features instant access to hundreds of great looking themes to choose from. It’s quick installation functions, flexibility, fast loading speed, and secure payment gateway helps it stand apart from others. With WP eStore – you can sell digital and non-digital products from your WordPress blog securely. You can sell services, tangible and non-tangible products from your site. For example, digital downloads, videos, music, photos, subscriptions, tickets, web hosting, collect membership fees, and much more. Magento Enterprise Edition and Magento Community Edition (open source) include many new features to help businesses grow. Most notable are a new responsive design reference theme that makes it possible to quickly get a tablet and smart phone-friendly site, a new payment option and streamlined checkout to help increase sales, and cross-border price consistency. Magento Enterprise Edition is the high performance eCommerce solution for fast-growing and large businesses. It’s got the enterprise-class features and the flexibility you need to create an eCommerce solution tailored to your unique needs. And to help you drive more traffic to your store, convert browsers into buyers and boost online revenue. Adding PayPal payment buttons is a low-cost way for you to accept credit card and bank account payments, and can be fully integrated with your website. Click here for more information. Of course, there are many more choices not listed here when deciding upon a shopping cart platform. Contact us to schedule your e-Commerce consultation and find out which solution is right for your online business! Checkout our eCommerce Plus CMS Web Design Package. Package includes everything you need to showcase your products online, and tell the world all about them. Sell online or SEO friendly catalog only.